Konnichiwa! 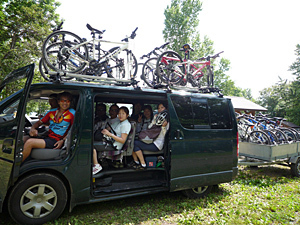 Cycling Japan is proud to offer you the real Japan experience with great cycling. 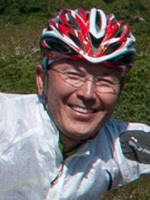 Since 2003, I have been guiding road cycling and mountain biking trips throughout Japan. As I’m a year-round cyclist who rides for work and for leisure, I’m confident to give you the best service from the cyclist’s point of view. I was born in a bike shop and inherited the DNA and the bike mechanical skills from my father and grandfather. My passion for riding a bike and playing with bikes is in my blood. I also spent three years in total in Hawaii as a windsurfer, and experienced “mana”, the spiritual energy of nature in the Hawaiian culture. It drove me to start a career as an outdoor guide. When I returned to Japan, I rediscovered so much beauty in our culture and nature. I was convinced then, this was what I want to do; explore Japan on a bike and share this beautiful place with cyclists from all over the world! After traveling globally, has created his base in Hokkaido, Japan. 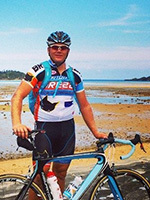 He has studied Adventure Tourism in Australia, and has been certified as a Rafting Guide. 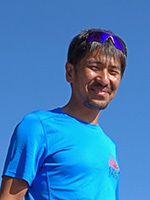 He has taken his acquired skills and international knowledge, and has been working as an outdoor guide in Japan and overseas. Before he started working for us, and aside from his time as an Adventure Guide, he also trained and taught courses in Wilderness Alert First Aid. He is in love with the beauty of Japan and is continually looking forward to sharing those secret trails, international allure and local culture with you. Based in Mt. 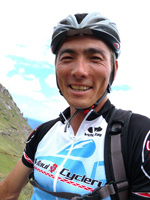 Fuji area, his passion for cycling and love of nature make you smile always on your ride. Mitt has also great skills for mountain climbing, camping, and brewing coffee. She loves traveling with her bike, hiking, camping, being outdoors, eating, and meeting new people. 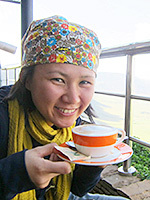 She studied Zen culture in Japan and oceanography in Hawaii, fell in love with mountain biking in Hawaii (met Ken and his wife Aiko in forest, Hawaii) and developed a passion for cycling adventures during mountain bike trips throughout U.S.
Cycling is now a huge part of her life. Her favorite things about guiding is seeing the smiles on people's faces while they are cycling on beautiful trails. It makes her happy! l had been working as a designer for a car company for a long time. 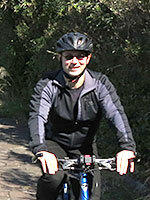 As I was working as a designer, I enjoyed a variety of outdoor sports whenever I had spare time. 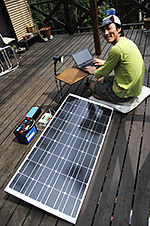 I believe that we can have much more fun in the nature when we use the mechanical equipments well. I have learnt all my mechanical skills by playing and having fun with them. When I was designing something, I used to look for an inspiration through the beauty of nature. As I was becoming 50 years old, I realized that I wanted to discover and experience more in life with bicycles, and that's when I decided to be a cycling guide. I'm moving to Hokkaido to broaden the possibilities for the future. Curiosity and action are the eternal vitality. I am the oldest in the company, however I believe ages don't matter to have good time. I am excited to show you and help you discover the best experience in Japan. Tatts started his bicycle life with the 90’s Mongoose MTB. He had ridden around his local trails a lot. He was keen on changing bike parts and maintaining his bicycles. After several years,he started training and going to race. He also had gone riding to overseas like United States,Hawaii and Europe with his bicycle. 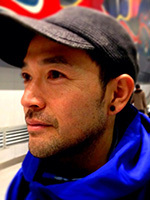 After graduating from University He has been working in photography industry for many years as a professional photographer. 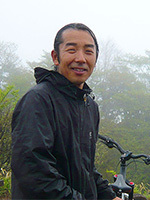 His working experience with traveling around the world motivates him showing Japan’s culture and beauties to cyclists from overseas. He always welcomes you and feels pleasure to share not only fun rides but also Japanese foods and to help discovering Japan’s unique culture through Cycling Japan’s guided tours. Andreas loves Japanese food so much that he studied Japanese food culture in Rikkyo University in Japan and got Master degree. He speaks German as mother language, Japanese, and English. Our German web site is made by him. Do you have passion for cycling and zest for guiding in nature? We are always looking for people to fit into our team. We try to keep our business small and efficiant. Our office can work with sunshine, bikes can work with your legs. A part of our profit goes to local cycling community. When you ride with us, you would save earth! One vehicle takes 8 people and 10 bikes on the roof. With a trailer, we can take 20 bikes in total. 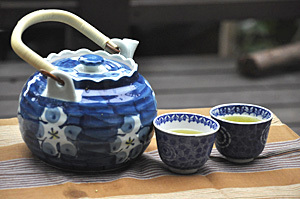 Why not enjoy green tea in an authentic way? We provide the best quality green tea on the way. 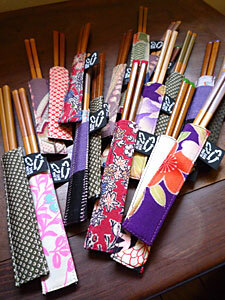 We give these chopsticks for you to use during the tour. This is to minimise the use of disposal chopsticks and save the trees! 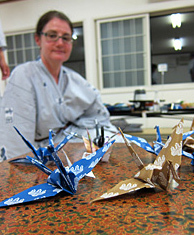 Become an origami artist on our trip.